In life, we may get caught in dead end jobs or stuck in careers that do not bring joy or excitement. With this free career planning checklist, individuals are able to assess themselves and find a career that is satisfying to them. People can get an understanding about what interests them or talents they may have. 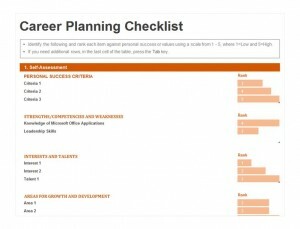 Beyond being able to help point a person to the right career, the career planning checklist is also able to help a person move up the corporate ladder by revealing strengths, weaknesses, and areas in need of growth and development. This fully customizable checklist can be downloaded and printed. Individuals can customize the checklist in order to adapt to their current career. Add additional categories or sections that can help to reveal more about one’s perfect career or oneself. The amount of customization that can be done to this form is limitless Also, businesses are able to download this form and pass them out among their employees. Businesses can customize this checklist and use them to find out what strengths and weaknesses a certain employer has. This checklist can be used to see if a person is a perfect fit for a particular position. Download the template from the site and open it. Customize the checklist to one’s liking to reflect individuality or a business. Read each section carefully and using the scale from 1 -5 rank each category listings against your personal values and success. When customizing the checklist be sure to keep it personal. Try not to include sections that do not pertain to you at all. The point of this checklist is to get you on the right path for you career. Adding unnecessary information can be confusing and decrease the effectiveness of the checklist. Be honest with yourself. If you have certain areas that you would like to further develop, don’t be afraid to put them on the career planning checklist. Hiding them from the checklist can hinder the career planning process. Allow the checklist to boast your confidence, not tear you down. The checklist may reveal a few areas that are in need of growth or a couple of your weaknesses. Instead of feeling down that these areas exist. Use the knowledge to create a stronger you.